Oklahoma Connection | Christian was raised in Oklahoma City and helped establish the Deep Deuce neighborhood in Oklahoma City. Even though Christian passed away in 1942 at the age of 25 following an illness, his technique and music continue to be taught in colleges and universities around the world. Born in Bonham, Texas, Oklahoma City became Charlie Christian’s home at the age of two. From a musical family, Christian first began playing the trumpet and at age 12 was playing a cigar box guitar he made himself. When his father and brothers formed a quartet, Christian received his first real guitar as a member of the group. They played Oklahoma City clubs, including those in historic Deep Deuce, before Christian’s reputation spread and he began touring across the United States before moving to California at the age of 23. Christian had changed the way the guitar was played, he brought it to the forefront as a solo instrument, amplified its sound, and changed what it could do with his single-string solo technique. Christian played with the greats—including Jimmy Rushing, Count Basie, and Benny Goodman. Even today, courses on and the techniques of Christian are taught in universities and studios worldwide. Carlos Santana has talked about the influence Christian had on him; B. B. King said he just wanted to be able to play like him, but never could; and the Jazz at Lincoln Center curator said he changed the sound of music forever. 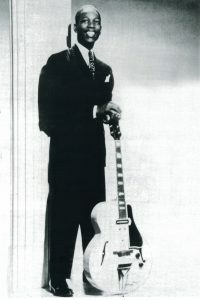 Who would have ever imagined that at the time of his death, at age 25, young Charlie Christian would be respected worldwide as the “Father of Bebop” and an inspiration to the greats that followed. See pictures of Charlie Christian and other media HERE.